How To Coupon: 6 Things You Should Know About Your Store's Coupon Policy! 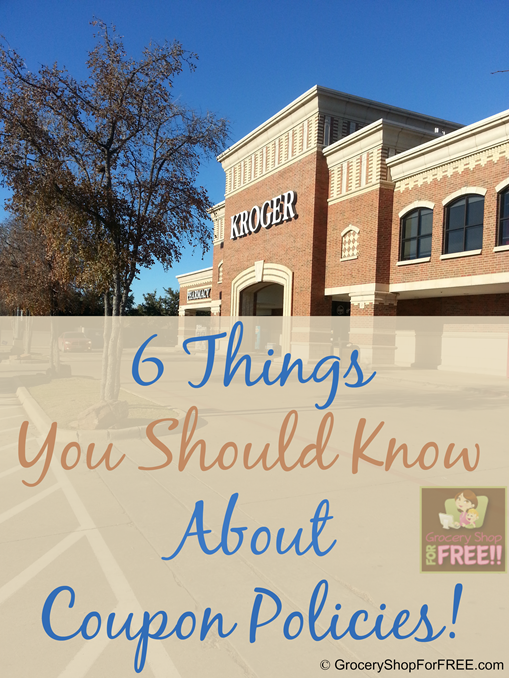 You are here: Home / Finance / Couponing / 6 Things You Should Know About Your Store’s Coupon Policy! 6 Things You Should Know About Your Store’s Coupon Policy! 6 Things You Should Know About Your Store’s Coupon Policy! So far in our How To Coupon series we have discussed 10 Places To Find Coupons and 5 Ways To Organize Coupons. Now it’s time to learn how to use them! Now we are going to discuss the 6 Things You Should Know About Your Store’s Coupon Policy. In order for you to get the maximum savings, stress-free while couponing, it’s important for you to know your store’s coupon policy. It’s always best to also carry a copy with you, in case there are any questions. Cashier turnover is high in stores and they don’t get the best training when it comes to the store’s coupon policy. Sometimes we have to educate the cashiers ourselves, sometimes we even have to educate a manager or two, as well. So, it’s best that we know what the policy is and have a copy with us to show them, if needed. Does Your Store Double Or Triple Coupons? If so, under what circumstances? Some stores double or triple on certain days. Some stores will say that all coupons under a dollar will be worth a dollar on certain days. Some stores have something called “doublers” and you only get a few in the paper that week you can use and you get to choose how to use them with your coupons to get the best deal. My stores will triple coupons up to $0.39 and double coupons up to $0.50. That means if I have a $0.35 off coupon, at my store, that coupon is worth $1.05 at the register, and a $0.50 off coupon is worth $1. It’s important to know these things before your start using coupons at your store. Does Your Store Give Cash Back? If a store gives cash back; will they give you actual cash back, apply it to a store gift card, or will they just allow you to apply it to your purchase? Some stores will take a $1 coupon for an item that costs $0.95 and they will just mark the coupon down to $0.95, which means you don’t get cash back and it’s not applied to your purchase. Some stores won’t take a coupon for over the amount of the item, so in the above example, they wouldn’t take that coupon for that product at all. I have 2 stores in my area that will give cash back or apply it to my purchase. So, when I can do a deal there and get cash back I will choose those stores over other stores even though those 2 stores don’t double or triple coupons. Will Your Store Take Printable Coupons? Some stores have specific rules that apply to printable coupons. Some stores won’t take one that has another retailer’s logo on it even though it says it’s a manufacturer’s coupon. Some stores won’t take a printable coupon that says FREE on it. Some won’t take a printable coupon that will make an item FREE. Will Your Store Price Match Another Store? Price Matching and Ad Matching are great ways to save on your bill. If your store Ad Matches that will usually mean you need to show them a competitor’s current ad and they will match that price for you. Price Matching is when you find an item for less at a local competitor and you tell them and they will match that price. Some stores will match online prices, as well. You just need to show them the online price and make sure in all cases that the items match exactly for size, type, quantity, and brand. What Other Types Of Discounts do They Take? Some stores take Competitor’s coupons, soft drink caps, and Catalina’s (coupons that come out of the “other” machine at checkout that you get with your receipt). What Is Their Buy One Get One FREE Policy? Some stores even outline their policy on Buy One Get One FREE sales and coupons. Do they allow you to use 2 coupons on a Buy One Get One Sale? Do they allow you to use a second coupon with a Buy One Get One Coupon? Will they let you use a Buy One Get One Coupon on a Buy One Get One Sale? All of those questions are very important and will help you save money, time, and aggravation if you have the answers. It’s important for you to be familiar with these 6 Things You Should Know About Your Store’s Coupon Policy! Where can I get a copy or print these rules and regulations for my stores? Most of the stores have them somewhere on their websites. Or you can ask the store for them.